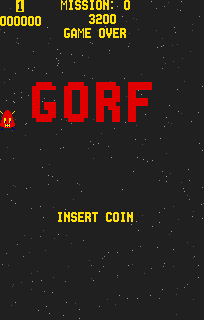 Gorf is an arcade game released in 1981 by Midway Mfg.. It was the first game in arcades to introduce multiple scenes in one game, even before Donkey Kong. It is a multiple-mission fixed shooter with five distinct modes of play, essentially making it five games in one. It is also well-known for its use of synthesized speech, a new feature at the time. Midway still owned the rights to publish Space Invaders and Galaxian in the United States and was looking for a way to make more money from those titles. Dave Nutting and Jay Fenton designed a game where the player could play through a series of space shooters instead of playing the same concept over and over again. 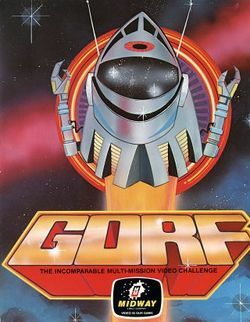 In Gorf, which stands for "Galactic Orbiting Robot Force", the player must take control of an attack ship that serves as the last line of defense between earth and the invading fleet. To accomplish the task of ridding Earth of this menace, you must pilot your ship through five distinct missions. First you must eradicate the invaders from space in an ASTRO BATTLE. Then you must launch to the main fleet, only to be stopped by an attack squad in LASER ATTACK. You will finally reach the fleet and destroy them in GALAXIANS. Then you will engage the enemy while you warp to the flag ship in SPACE WARP. And finally, you must take the flag ship down in none other than FLAG SHIP. Each time you successfully complete all five missions, you move up one rank and start over again at a higher degree of difficulty. Gorf created a little but of controversy. While Astro Battle was remarkably similar to Space Invaders, Namco felt that the use of the Galaxian game play was unauthorized. Namco subsequently forbid the Galaxian portion of the game to be included in any home conversion of the game, so most conversion contain only four stages. But there were still a few home conversions made, and they were quite popular. You pilot a spacecraft throughout five different missions. Your spacecraft can move side to side, as well as up and down throughout the lower portion of the screen. You can fire your weapon at any time. If you happen to fire when a bullet is already on the screen, that bullet will be instantly canceled and a new bullet will appear. You must avoid contact with any enemy weapons, and avoid direct collision with the enemies themselves. If you complete all five missions, you will be promoted to a new rank, and you will start the missions over again at a higher degree of difficulty. This page was last edited on 29 November 2008, at 03:49. This page has been accessed 18,578 times.